Swelling often indicates a condition or damage in the body that needs medical attention. Swelling is most often associated with flesh injuries or damage to structures in the body, such as the bones, tendons and ligaments. But some forms of swelling can indicate serious conditions affecting the cardiovascular system. Children who develop swelling in their hands may also be suffering from conditions needing specialized medical attention. Hand injuries are the most common cause of swelling in the hands. 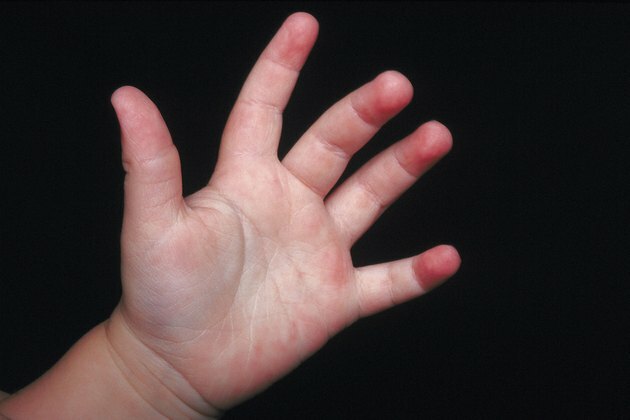 These can occur when the blunt trauma of an object striking your child's hand breaks blood vessels in the hand. Bone bruises or breaks can also cause swelling, as well as tenderness and bruising. If pain is significant or your child is not able to move or use her hand, a broken bone or other structural damage is likely. Call or visit a doctor to have the hand examined. Sickle cell anemia is a genetic disorder that causes misshapen red blood cells in your body. Children suffering from sickle cell anemia often suffer from a shortage of oxygen due to the blood cells' reduced ability to carry oxygen throughout the body, and the shortened lifespan of sickle cells can cause a shortage of blood cells in the body. Swelling in your child's hands can be an alarming development caused by sickle cell anemia, and it should not be ignored. Contact your doctor immediately, and bring your child to a doctor or the emergency room. Kawasaki disease is an unusual illness most commonly affecting children ages 5 and younger. It is a mysterious disease that is only identified by ruling out other illnesses as possibilities. Your child will likely suffer from a persistent fever for five or more days, and the disease sometimes damages the heart and main arteries in your child's body. Swelling in the hands is sometimes a symptom, although it usually does not develop on its own. If your child develops swelling in the hands, call your doctor. The development of other symptoms, such as a fever, chills, faintness or nausea, could indicate a much more serious development in your child's body than a simple tissue injury. When swelling develops in your child's hand, call a doctor and report the injury, along with accompanying symptoms. Your doctor can then make a decision on whether to treat your child at home or bring him in for professional medical attention. What Causes Bulging Veins in Teens' Hands?